Coming from Tom Hooper, director behind the Academy Award-winning film ‘The King’s Speech’ (2010), ‘Les Misérables’ is the latest film adaptation of the world-renowned musical and the classic book of the same name. Starring Hugh Jackman, Anne Hathaway, Russell Crowe, Helena Bonham-Carter, Amanda Seyfried, Sacha Baron Cohen and Eddie Redmayne, ‘Les Misérables’ is this year’s cinematographic achievement like no other, nominated for eight Academy Awards, including Best Picture. Adapting the world’s longest-running musical could not have been easy, and Tom Hooper does a remarkable job with his latest film. In this film adaptation, there are realistic settings, fabulous costumes and just breathtaking shots of 19th-century France on the brink of the revolution. 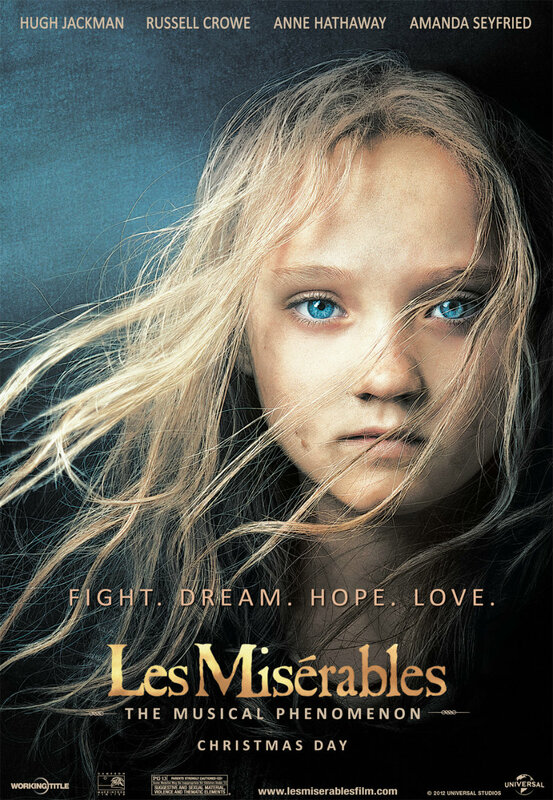 From moving song coverages (e.g., ‘I Dreamed a Dream’, ‘On My Own’), using close-up camera-work, to great action sequences portraying the French Revolution, ‘Les Misérables’ provides an almost unique film-musical experience. The attention to detail in this film is ever present, and Hooper’s film comes across as very emotional, largely thanks to the brilliant cast and their great work. ‘Les Misérables’ closely mirrors the musical, and here lies one of its main achievements. Throughout the film, the actors “sing” their lines, instead of following conventional dialogue sequences, and this brave attempt by the director to maintain the authenticity of the musical is to be applauded. This lyricism also attributes to the film being so powerful and emotional. Besides, considering that few main actors involved in the production are professional singers, and that the singing was actually performed live on camera to capture spontaneity, the effort is admirable. The film production also managed to capture moments in the book which theatrical productions could never have done. For example, there is a scene in the film where Jan Valjean travels in a couch with Cosette as she is falling asleep. Jan Valjean’s lyrics reflect his new found hope in this little girl, as he has took this responsibility on, and now looks ahead and hopes for a better future for the two of them. Hugh Jackman’s acting in this film is excellent. Losing many pounds for his role of Jean Valjean and going without water to make his eyes appear “prisoner-like”, Jackman’s input and determination are constantly felt in the film. His character becomes a man truly obsessed by his persecution, but, at the same time, determined to put his dark past behind him and start a new life. Anne Hathaway also gives an exceptional, emotionally-charged performance in her role of the poverty-stricken mother. Incidentally, Rebecca Hall (‘The Prestige’ (2006)) was also auditioned for the role of Fantine, and possibly would have made as realistic portrayal of the character. The true revelation here is Russell Crowe, who plays Javier, a ruthless policeman persecuting Jean Valjean and also the very incarnation of law-and-order mentality. Crowe’s looks and his deep voice make his character a true likeness and an interesting character study. Crowe has gone a long way to playing Javier, being unable to understand his character’s motivations at the beginning. His scenes become some of the most anticipated in the film. The most memorable scenes are those where Jean Valjean (Hugh Jackman) encounters Javier (Russell Crowe), and it is interesting to see their interaction. Crowe’s performance is especially powerful, because he manages to convince the audience in his character’s emotional turmoil and logic of his character’s actions, which are actually very hard to comprehend, let alone sympathise with. The laughs in ‘Les Misérables’ are provided by a curious couple, Thénardiers, who run a guest-house and who mistreat little Cosette in the film. Sacha Baron Cohen and Helena Bonham-Carter play the couple, eliciting a number of laughs from the audience, as they skilfully empty the pockets of the people they come in contact with. Aaron Tveit as Enjoras, a friend of Marius, is also a very good casting choice. By focusing on Eddie Redmayne as Marius, few people seem to notice Tveit, and yet he gives a really dignified performance, showing off his character’s commitment to the cause. Although the camera in ‘Les Misérables’ could have been more conventionally used and focused, containing less of all those unnecessary and distracting close-ups, it may still be fair that different “rules” of film-making apply here, to this film, since it is essentially a musical. The “theatrical” feel of the movie may mean that it loses some of its usual cinema-goers, but, at the same, it can potentially “convert” many others to the hobby of theatre-going. Good review. This is one of those musicals that just took my ears and my heart by-storm and almost loved it all. Almost. Nice review. I know I’m the minority here, but I didn’t like this one. I enjoyed the performances but felt the camerawork was weak. Thanks! I do agree with you – the camerawork was the weakest link. It could have been much better.